The Speech Therapy Bloggers of Speech Spotlight are showcasing what we have in our Teachers Pay Teachers stores to make your March speech therapy planning a little easier! 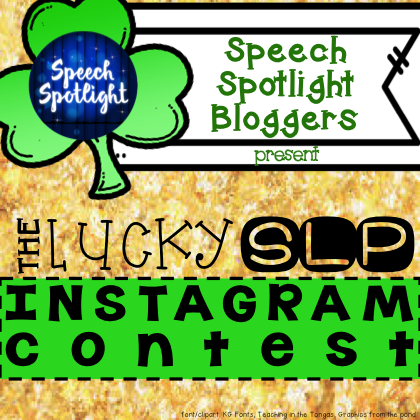 Dr. Seuss Day, March Madness, St. Patrick’s Day, Spring Break, Easter and more can make any SLP get a severe case of spring fever! Come back after you have visited each of us on Instagram (contest begins at 8:30 EST Tuesday, March 1 and ends 8:30 EST Friday March 4!) and enter the phrase in the Rafflecopter below for your chance to win. Here’s a hint: What are you? Great hop! Thank you…fingers crossed!